Where on Google Earth #207. 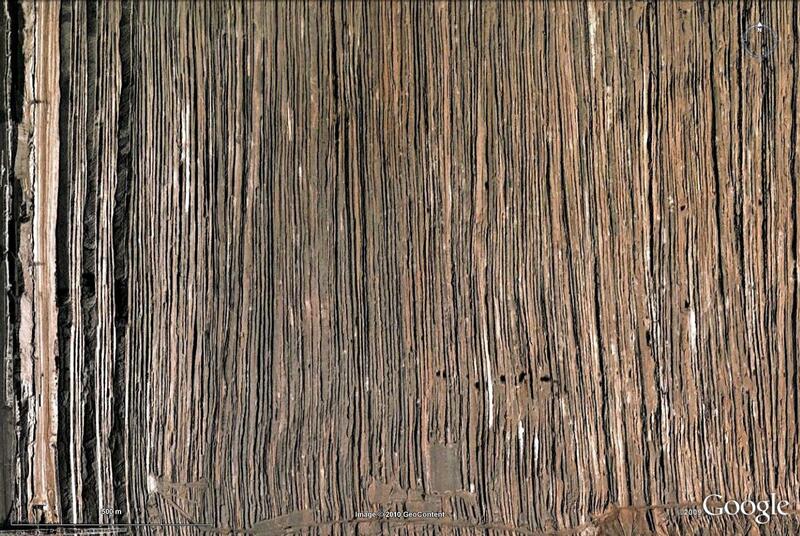 Für diejenigen, die neu bei Where on (Google) Earth sind: einfach einen Kommentar mit geographischer Länge und Breite (oder eine Ortsbezeichnung) hinterlassen und darin etwas über die (geologischen) Besonderheiten in diesem Bild schreiben. Der Gewinner darf dann das neue WoGE aussuchen. Weil dieses WoGE doch recht offensichtlich ist, gilt Schotts Regel: frühere Gewinner müssen für jedes WoGE, das sie erraten haben, 1 Stunde mit der Antwort warten. Veröffentlicht am 20. Juni, 14:00 MESZ (12:00 UTC). I think I didn't scored 24 wins in WOGE, yet, so here is my answer: The image features the tailings of the Welzow-Süd open cast lignite mine west of Spremberg (Brandenburg) that are dumped by a "Förderbrücke", a machine that excavates both the coal and tailings and works its way westward in this example I believe. The coals are of a miocene age. They are probably mining the 2nd Lusatian Coal Seam. It's the only one to my knowledte currently in production. Lost Geologist, that's correct. WoGE 208 is yours – post a notice here when it's ready. 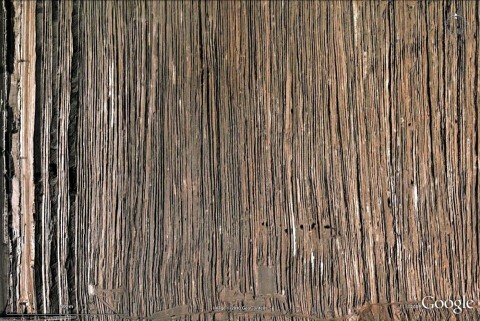 The photo in Google Earth is quite old however. A newer view is available using the DOP Viewer. With the higher resolution you can also better see the overburden conveyor bridge F60 (“60” means it can remove a maximum overburden thickness of 60m) which is the largest moving machine in the world. Looks quite impressive when you're standing below one. As it moves back and forth (north-south in this case) in the pit, it removes overburden at the front. The overburden is transported over the bridge on conveyor belts and dumped at the back. Thus you get this series of N-S striking, tilted layers („Rippen“ in German – could anybody translated this correctly please?) which then are recultivated more or less successfully. The Miocene sediments are prone to acidification because of their high pyrite content, and the Pleistocene material is mostly quite pure, low-fertile sand, so growing something there is sometimes hard. I am currently traveling but will be back friday. I hope it is ok if I post the image and link here then. Regarding your score: Ron Schott's KMZ file, which I linked at the top of my post, contains a list of all winners and how often they won.